COLUMBIA, SOUTH CAROLINA "A to Z"
Columbia ... 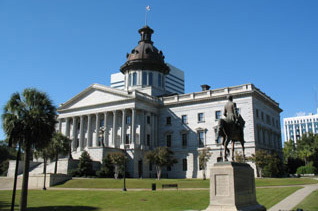 The first city, as well as the first-planned capital, in America named for Christopher Columbus was founded March 26, 1786, as the center of government, education, and commerce in the Palmetto State. Today, the Columbia Metropolitan Area is home to over 200 years of history, beautiful Lake Murray, the University of South Carolina, the Army's largest training base at Fort Jackson, numerous festivals and recreational opportunities. The Greater Columbia area is a great place to live and work. Yes, it is! One owner since April 29, 1997! I have used this website for my real estate business, but, since I am retiring, this PREMIUM DOMAIN will no longer be necessary for me in my retirement. Call Mel Coker today to inquire. (803) 388-8011.
without the permission of the owner of this domain. Page design and all coding by Mel Coker, webmaster.